In this Indian name, the name Sivan is a patronymic, not a family name, and the person should be referred to by the given name, Santhosh. Santosh Sivan (born 8 February 1964) is an Indian cinematographer, film director, producer and actor known for his works in English Cinema, Malayalam cinema, Tamil cinema, Telugu cinema, Hindi cinema. Santosh graduated from the Film and Television Institute of India (FTII) and has to date completed 45 feature films and 41 documentaries. He is a founding member of the Indian Society of Cinematographers (ISC) and is the most awarded Director of Photography (DOP) in India. Santosh became the first Cinematographer in the Asia-Pacific region to join the American Society of Cinematographers (ASC) membership. As a cinematographer, he has won five National Film Awards – including four for Best Feature Film Cinematography. As of 2014, he has received eleven National Film Awards, and twenty one international awards for his works.He was awarded the Padma Shri for his contributions to Indian cinema in 2014. Santosh was born into a family of artists. His grandmother used to teach him painting and music in the palace and as a kid he accompanied her to the palace. These visits gave him an opportunity to become familiar with the paintings of Raja Ravi Varma, a nineteenth-century Indian painter whose renowned works were themes from Hindu mythology, and everyday life of his times. He graduated from Loyola School, Thiruvananthapuram. His father used to make documentaries and during holidays he would excitedly, volunteer to help. These trips were very interesting. He loved sketching with charcoal, and was fascinated by details that you observe when you want to sketch. During these travels to remote areas in South India, he was fortunate to listen folklore's and stories of people of the land. He is the younger brother of filmmaker Sangeeth Sivan and elder brother of Sanjeev Sivan. The trio are the sons of the well known cinematographer and director Sivan. Santosh, a founder member of the Indian Society of Cinematographers and the most awarded Director of Photography in India, graduated from the Film and Television Institute of India and went on to completing 45 features and 41 documentaries. He was awarded the National Award for best Cinematographer for the films Perumthachan (Malayalam/1991), Kalapani (Malayalam / 1996), Mohiniyattam (Malayalam / 1991), Iruvar (Tamil/1998) and Dil Se.. (Hindi/1999). Santosh was honoured by the Japanese Society of Cinematographers and has been on the Jury for the Busan Film Festival. He is a "mentor" to students for Mira Nair's "Maisha Film Lab: in Uganda and is a director to the Sivan Foundation of photography. He was also a governing council member at the Pune Film Institute. As a director, Santosh won his first National Award in 1988 for the film Story of Tiblu (1988). His film Halo was honoured at the 43rd National Film Awards as the Best Children's Film and Best Sound. Santosh received worldwide accolades for The Terrorist (presented by John Malkovich), which won the Best Director, Best Actress Awards and the Golden Pyramid Award for The Best Film at the 23rd Cairo International Film Festival. It was awarded the National Award (1999) for The Best Tamil Film and was an Official Selection at the Sundance, Seattle and Toronto Film Festivals of that year. The film was also listed in Roger Ebert's 100 Best Films (1999). the film was Quoted as being "a film scripted by the camera"
Following the success of The Terrorist, Santosh's film MALLI won the National Award for Best Environmental Film in India (2000), the National Award in India for Best Child Artist (2000) and was honoured at the 18th International Festival of Film for Children in Poznan, Poland where it won the Poznan Goat for Best Director, Best Child Actress & Best Music and the Best Film-Audience Award at the Indian Film Festival|Indian Film Festival of Los Angeles in Los Angeles. Santosh's subsequent films include ASOKA, which screened at the Venice and Toronto Film Festivals (2001) and Navarasa, which won the National Award for Best Tamil Film (2004) and the Monaco Award for Best Film & Best Supporting Actor awarded at the Lyons Film Festival. The latter also participated in the Pusan and Rotterdam Film Festivals. His debut Malayalam Language film as director, Anandabhadram (2005), went on to win several State Awards, including Best Director & Best Cinematographer. Santosh has worked as the Cinematographer in Gurinder Chadha's Bride & Prejudice (2004) and Paul Mayeda Berges' The Mistress of Spices (2005). Santosh directed Before the Rains which is premiered as a Special Presentation at the Toronto International Film Festival (2007). In addition, his short film PRARAMBHA, which was created for the Bill and Melinda Gates AIDS Foundation, also premiered at the Mavericks section of the Festival. It won the National Awards 2007 for Best Producer and Best Director in the Educational and Motivational Film category. His latest Malayalam film, Urumi (2011) was screened at the Indian Panorama of the International Film Festival of India to be held in Goa 2012, to Busan and NHK film festivals. He was also the cinematographer for the Tamil movie Thuppakki, starring Vijay & directed by AR Murugadoss. In an interview, he said that some films he chose, not mostly because of the story but due to the very fact that he was comfortable with the director, a bigger pay cut and friendship things. In 2008, Santosh Sivan Films was formed, as a Pvt ltd concern, with Producer Mubina Rattonsey and Milind Verekar. The company has not only handled film ventures successfully but has to its credit numerous commercials, documentaries and music videos as well. Feature film credits include Terrorist, Malli, Navarasa, Anandabhadram, A Hollywood film "Before the Rains" for Echo Lake Productions, Prarambha, a short film for The Bill and Melinda Gates AIDS Foundation, Tahaan-A Boy with the Grenade, Urumi-Vasco Da Gama and more recently done Ceylon.Tahaan, won a High Commendation in Children's Feature Film section at the 2009 Asia Pacific Screen Awards and UNICEF Award at 11th Olympia International Film Festival for Children and Young People in 2008 held at Greece. It also won "The German Star of India award" at "Bollywood and Beyond" festival at Stuttgart Germany in 2009. Santosh's documentary Farmers Portrait is near completion. He makes films on health and environment issues, like the Polio campaign with Amitabh Bachchan. His 2007 release, Prarambha won the National Film Award for Best Educational/Motivational/Instructional Film at the 55th National Film Awards. The film dealt with the stigma attached to an HIV + person. It dealt with a little boy who had been ostracised from school only because he is diagnosed with HIV. This film highlighted the plight of the boy and highlighted the ignorance of the society towards this virus. It dealt with the myths surrounding HIV and aimed at educating the masses through an entertaining story weaved around the little boy. This was produced by the Bill and Melinda Gates Aids foundation and was shot entirely in Mysore. 2012 Thuppakki Tamil Special appearance in the song "Google Google"
2008 = Before the Rains= Crystal Kodak award for best cinematography. 2009, Tahaan= Tahaan won a High Commendation in Children's Feature Film section at the 2009 Asia Pacific Screen Awards. ^ Gulzar, Govind; Saiba Nihalani (2003). "Biography: Sivan, Santhosh". Encyclopaedia of Hindi Cinema. Encyclopædia Britannica (India). p. 633. ISBN 81-7991-066-0. ^ "Simbu's next Kettavan just got bigger, ace lensman Santosh Sivan joins the team". 3 August 2017. Retrieved 26 February 2018. ^ "'Lies We Tell' filmed by Santosh Sivan set to release on February 2 next year". The New Indian Express. Retrieved 26 February 2018. ^ "Santosh Sivan filming his next international film in Britain". The Indian Express. 3 October 2015. Retrieved 26 February 2018. ^ "After fifth Hollywood film, Santosh Sivan takes a break". The Indian Express. 14 June 2016. Retrieved 26 February 2018. ^ Menon, Vishal (19 August 2017). "Greener than the greenest grass: Santosh Sivan and 'Roja'". The Hindu. ISSN 0971-751X. Retrieved 26 February 2018. ^ "Santosh Sivan excited about next film". 10 March 2016. Retrieved 26 February 2018. ^ Desk, The Hindu Net (9 February 2018). "'Chekka Chivantha Vaanam': Mani Ratnam's next film has a rich ensemble cast". The Hindu. ISSN 0971-751X. Retrieved 26 February 2018. ^ Ians (10 July 2017). "Mani Ratnam, Santhosh Sivan team up for sixth time". The Hindu. ISSN 0971-751X. Retrieved 26 February 2018. ^ "Padma awardees 2014". The Times of India. 25 January 2014. Retrieved 26 January 2014. 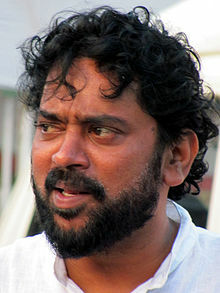 Wikimedia Commons has media related to Santosh Sivan.